Indexed by Current Contents, Biological Abstracts, BIOSIS Previews, Google Scholar, Journal Citation Reports, Science Citation Index Expanded, SCOPUS, Zoological Records. A quarterly open access journal, issues appearing in February, May, August and October. The latest issue of SALAMANDRA (55-1) is published on 15 February 2019. As of now, SALAMANDRA’s publication modus will considerably change. The development of costs for the journal production as well as the changing requirements in scientific publishing forced the DGHT to introduce several modifications. These mainly include online only publication of SALAMANDRA and introduction of publication fees for authors, who are not regular members of DGHT, to cover part of the production costs. These publication fees are rather moderate and affordable compared to other journals at an international level (please find detailed information here). Quarterly publication of issues with open access remains unchanged, but virtually without any limitation with regard to annually publishable numbers of pages. 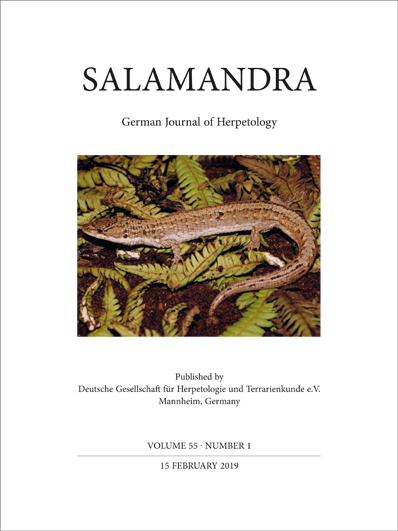 The "Deutsche Gesellschaft für Herpetologie und Terrarienkunde e.V. (DGHT)", meaning German Society for Herpetology and Herpetoculture, was founded in 1964 as a successor of the group called "Salamander" which originates from the year 1918. As the name implies, the DGHT covers non-professionals and professionals in herpetology and herpetoculture within a single organisation, thus giving our society its particular strength. Our members work with amphibians and reptiles as it concerns research and husbandry, as well as conservation of species and their habitats.